If what I learned at the National Museum of Anthropology in Mexico City is true, our civilization is definitely on the decline. The museum had this little display of bowls, which went from crude to elegant and back to crude. The guide explained that the care taken in producing these bowls coincided with the rise and fall of a particular culture in Mexico. In my opinion, the lack of pride in workmanship in America and elsewhere tells the story of our eventual demise. For instance, I grew up during a time when if you needed furniture, you went to a store, chose your item, and it would be delivered just as you saw it in the showroom. It was well constructed and delivered assembled. That piece would last forever—and one did not have to put it together or sacrifice price for quality. Like the manufacturers of the furniture, the delivery people also took pride in their work. They were respectful and put up with my mother who would change her mind a million times as to where she wanted the new furnishings placed. She sometimes had them rearrange other rooms as well. Then, she would search for a scratch or ding and call up the store to demand money off the bill. Of course, she always cooked a delicious meal for them, which they greatly appreciated. We were far from rich, but my mother used her artistic skills to make our home a showplace. I suppose she inherited her love of design from her paternal side of the family who own a furniture business in Teramo, Italy. Their pieces are like three-dimensional works of art—beautiful, unique, well made and creative. She then passed that love on to me. I remember my grandfather, a carpenter, teaching me about measuring twice and cutting once and why creating something beautiful by hand is important. Once my mother made a cover for a sofa. She forgot the seam allowance and it was too small. Frustrated, she flung the thing into the middle of the street. We both stood at the window and watched as cars ran over it. Her face twisted into a look that showed she was searching for a solution, and after a few hours, she brought it back into the house and threw it in the laundry. Afterwards, she took it all apart and added piping. It fit. It also looked fabulous. Today, I furnish my place with stuff from flea markets, garage sales, dumpsters, consignment stores (where I trade in other things) or Craigslist. We don’t have much, but what we have has quality workmanship. Even when we lived in a trailer for two years, I decorated it to look like something that could be photographed for a magazine. And if I lived in a cardboard box, my box would win an award. I would see to it. I guess my immediate surroundings affect my mood more than most people. 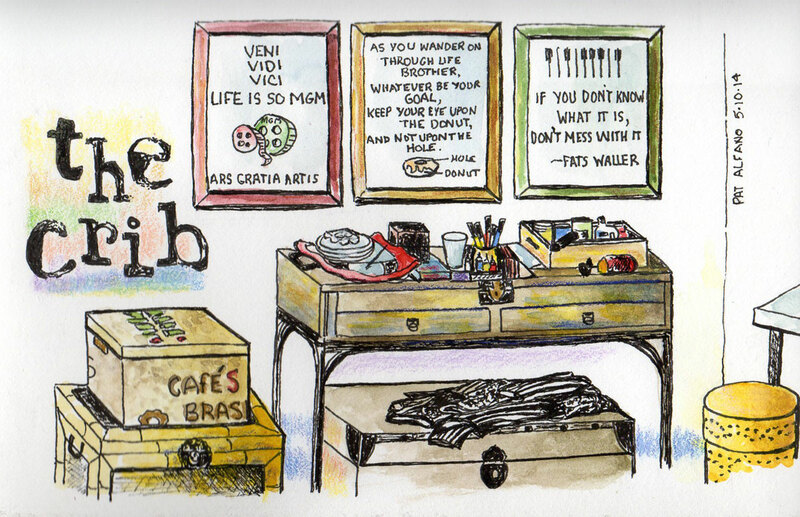 How can I get depressed when I can sit in my well-organized closet and look at all my stuff? It makes me feel both grateful and visually pleased. The other day, I decided that I needed to find something for all my art supplies. Right now, they have taken over my space and are threatening to invade places where they should not be—like the bathroom. Easy enough, I thought. I began searching on Craigslist, and then moved on to places like Cost Plus and Ikea. I’m not a big fan of having to assemble my furniture. First, I never do it correctly. Second, I need to recruit at least two other people to hold parts together as I add more parts (incorrectly). Then there is all the disassembling and reassembling—at least 20 times. Finally, as I scrutinize what I am about to buy, I hear my grandfather’s words on how to create a fine piece of furniture. Like the bowls in the Mexican museum created during the cultural decline, the quality makes me cringe. As I looked for my art storage piece, everything I found was either too expensive, the wrong size or out of stock. Why a company would post an item when you can’t buy it online or in the store is beyond my understanding. At one place, I thought I would try to find out when the out-of-stock item would be available and get some answers to other questions. I didn’t want to buy from them anyway. It has been my experience that their stuff, which is not that inexpensive, falls apart after a short time. Besides, the names of all the things are in Norwegian. Or Lithuanian. Or something. I still haven’t found what I need for my art supplies. They stare at me from inside of stuffed bags scattered here and there. I will wait until I find just the right thing. It will be affordable, beautiful and whisper to me that there is still hope for our civilization. This entry was posted in Ancestors, Art, Culture, Family, Living, Observations, Traditions and tagged Anthropology, art, culture, decor, Family, Furniture, Interior decorating, Living, memories, Mexico, Misadventure, Observations, product quality, Projects. Bookmark the permalink. The free furniture economy is quite lucrative i hear…. did that @ubc researcher get her bed bug cure out yet?